Here's the current ACA tax credit table again, followed by the BCRAP table. As noted in Part One, one problem with the ACA--an utterly unnecessary problem created exclusively by Republican Governors and/or state legislators, I should add--is that 4 years into the Medicaid expansion provision, 19 states have still refused to expand the program. As a result, around 2.6 million people earning less than 100% of the Federal Poverty Line (~$12,000/yr) are caught in the "Medicaid Gap": They earn too much to qualify for Medicaid in their state, but too little to qualify for tax credits under the ACA. Another ~1.9 million earn 100-138% FPL, which means they still don't qualify for Medicaid but they can at least enroll in private exchange policies and receive heavy APTC and CSR tax credits. The ideal solution for all of these folks would be for those states to simply expand Medicaid under the ACA. A weak backup solution, however, would be to at the very least remove the 100% lower-bound limit on APTC/CSR. This would put those 2.6 million "Gap" people at least in the same boat as their 100-133% FPL brethren. I even suggested this as part of my "If I Ran the Zoo" proposals, Ironically, it was someone opposed to the ACA who pointed out that if this was done under the ACA itself, it would guarantee that 1) none of those states would ever expand Medicaid, and furthermore that 2) some states which have expanded it would likely reverse their decision. Why? Because the states do have to pay a portion of Medicaid even under ACA expansion (5% this year, rising up to a maximum of 10% over the next couple of years)...whereas both APTC and CSR assistance is paid fully by the federal government. On the surface, only having to pay 2% of your income may not sound too bad, but remember, we're talking about people earning less than $16,000 (single) or $33,000 (family of 4). Even $20/month or so can mean the difference between having your your heat turned off or buying milk for your kids or whatever. However, the larger problem is that after 2019, Cost Sharing Reduction is wiped out at all income thresholds. But there's a huge catch. The ACA based income-adjusted subsidies are based on a benchmark "silver" plan with an actuarial value (AV) of 70%, meaning the plan is designed to cover 70% of the average enrollee's annual medical costs. 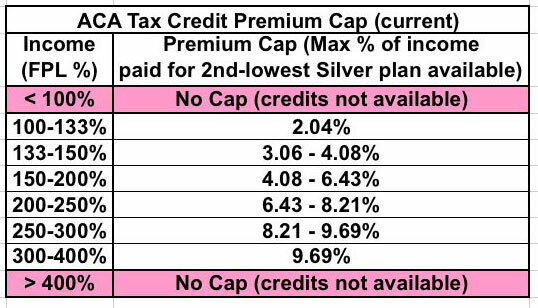 For low income enrollees - the majority of marketplace enrollees -- silver plans are enhanced by Cost Sharing Reduction (CSR) subsidies that raise AV to 94% for those with incomes up to 150% FPL, 87% for those in the 150-200% FPL range, and 73% (a near-negligible boost) for those in the 200-250% FPL range. That usually means deductibles in the $0-250 range for people with incomes up to 150% FPL and $500-1000 for the 150-200% FPL cohort. Medicaid enrollees in expansion states generally have no deductible and little to no out-of-pocket expense. The Senate bills drops the AV of a benchmark plan to 58% -- below that of the ACA Marketplace's bottom-level bronze plans, which have an AV of 60%. Bronze plans generally have single-person deductibles over $6,000 -- a fact Republicans have cited endlessly in asserting that the ACA makes coverage unaffordable. As Sprung goes on to point out, under the BCRAP bill, eventually around 20 million people (~15 million currently enrolled in Medicaid expansion, ~5 million with strong CSR policies) would be shifted from plans with an AV of 87-99% over to bare-bottom Bronze plans with AVs of 58%. A $6,000 deductible is ugly enough when you earn $40-$50,000 a year; below $16,000 it's utterly pointless. Oh, and one more thing about the Individual Market: I noted this in Part One but it bears repeating: BCRAP wipes out the individual mandate entirely. Yes, that's right...not only are they wiping it out (technically the mandate penalty still exists, it's simply changed to "$0.00"), they're making the repeal retroactive to 2016. That means a federal tax refund to around 6-7 million households who had to pay the penalty this year (and obviously means they wouldn't be enforcing the mandate whatsoever next year either). Now, here's the thing: As I note in my "expanded three-legged stool" entry, the "red leg" (Enrollee Responsibility) actually consists of two sections: The individual mandate...and the limited-time Open Enrollment Period. The BCRAP appears to keep a strictly-limited Open Enrollment Period (and in fact is cutting it in half, from 3 months to just 6 weeks starting this fall), so it's possible that this, combined with CMS's crackdown on off-season (Special Enrollment Period) signups, will cover some of the same function as the mandate penalty. However, if it doesn't, talk of "Death Spirals" will become reality.